O'Donnell's studio in New York. The serious business of slimming down is easier when you do it with friends -- and laugh about it a lot. That's the premise behind Rosie O'Donnell's Chub Clubs. The daytime talk-show host launched the concept in January, urging viewers to band together with a few friends to tackle the mission statement: "Eat less ... move more." 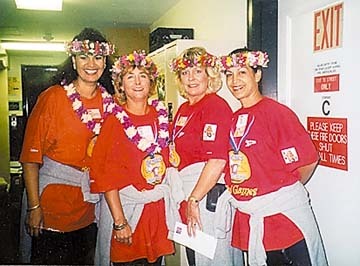 In Hawaii, four admittedly nutty women organized themselves into a Chub Club -- the Double Stuffed Oreos -- and adopted the Chub spirit so well they will appear tomorrow in "The Rosie O'Games" on O'Donnell's show. Chief Oreo -- who lost half the group's total poundage -- is Bernie Keliiaa of Halawa Heights. Keliiaa put on more than 30 pounds when she suffered a herniated disk last year and through regular walks and a low-carbohydrate diet has lost most of that. She is joined by two co-workers at Hawaiian Airlines and one other friend, all serious Rosie fans, who are using various exercise and eating plans to get in shape, too. To win a spot among 40 Chub Clubs in the Rosie O'Games, the Oreos made a video of themselves at play. Each woman had a coconut in a nylon stocking dangling between her legs and swung the coconut so it would bump an orange across the ground. They wore haku lei and pareaus. A clip of their antics was shown on O'Donnell's show. "She thought we were kinda crazy," Keliiaa says. "And we are." So they were invited to New York, where earlier this month they taped the Rosie show (they played a game that involved passing tossed salad from person to person in bowls attached to helmets on their heads). As you can see, this sort of activity is more about fun than calorie loss, but the nation's Chub Clubs do get serious sometimes. Among O'Donnell's challenges to each of them was to participate in a 5K walk or run this year. The Oreos did the Dolphin Dash on the Big Island in August, and Keliiaa says they plan to enter more. It's just easier when you're not alone, she says. "The group support -- everybody's constantly doing it -- there's always somebody you can talk to about it."